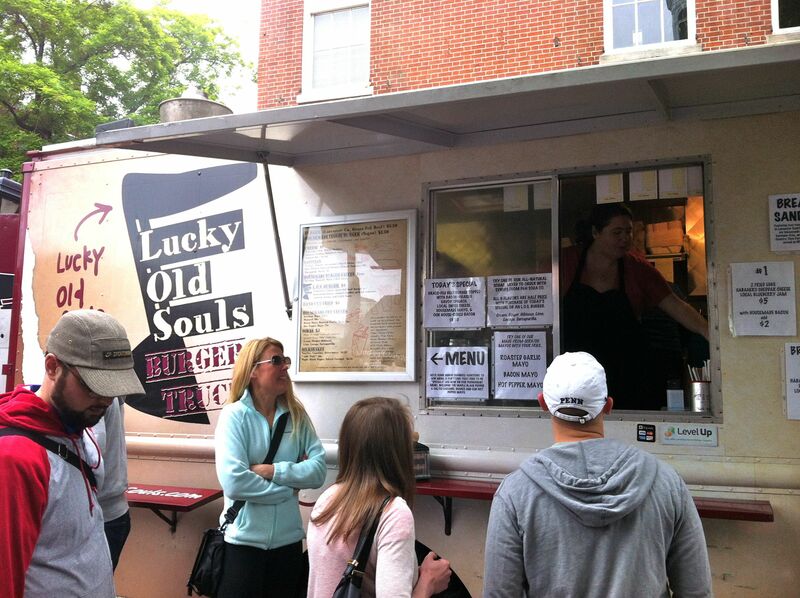 I remember the first time I heard about Lucky Old Souls Burger Truck. I was pumped to hear of a food truck selling burgers with grass-fed Lancaster County beef and unique milkshake flavors like maple, black pepper. Yeah! Unfortunately, it took too long to get the opportunity to check them out. Luckily, Headhouse Square opened back up a couple of weekends ago. Yay, Headhouse! I’ve written tons about our Sundays at Headhouse and it’s finally back in business for the season! On our way over to the truck, with the dog of course, we ran into some friends who had just ordered their food. They told us that we just had to order the breakfast burger. 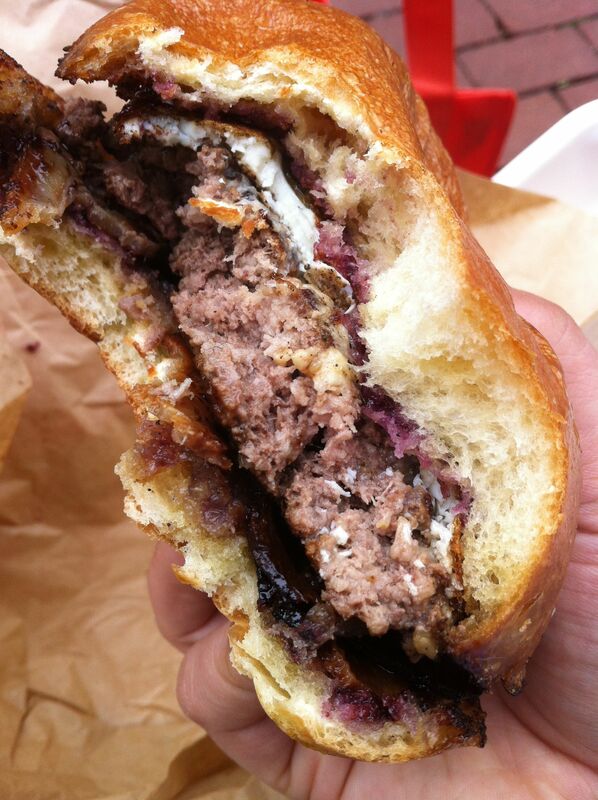 The breakfast burger consists of a whopping grass-fed beef patty, bacon, habanero cheddar and local blueberry jam, all topped with a fried egg. Oh yes. How could we resist? In an attempt not to be completely piggy, we opted to split the massive burger, contained in a buttery brioche bun. But then I added fries. Of course I did. 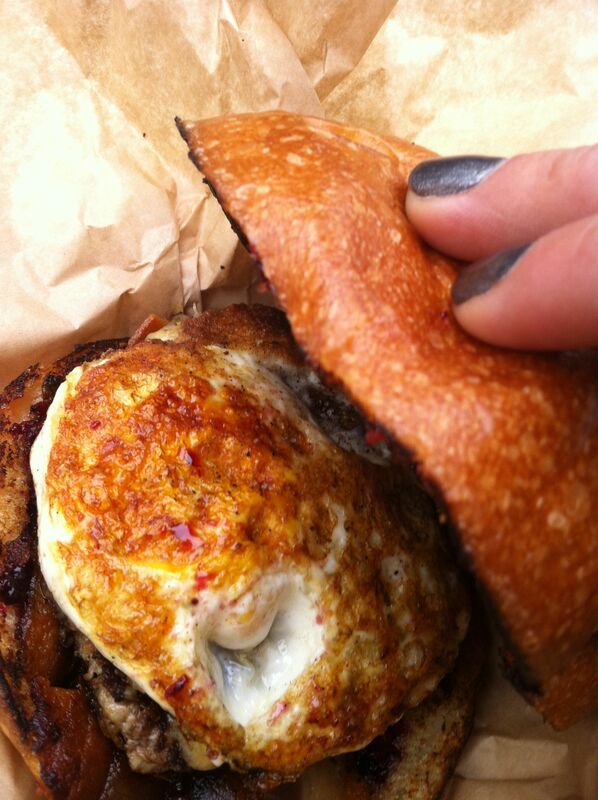 Check the fried egg nestled under the grilled bun. Now check the cross section. I think Guy Fieri would call this the money shot. For those of you wondering what’s up with the blueberry jam?? It worked. It totally worked. The sweetness of the jam paired beautifully with the savory burger and the slight heat from the habanero cheddar. And the bacon. Well, bacon obviously makes everything better. And then there were tasty little morsels of fried egg–a little cooked, a little runny–just the way I like it. You have to taste it to try it, but these weird and slightly discombobulated ingredients just worked. LOS knows what they’re doing. So if you thought a maple and black pepper milkshake sounded weird, think again, my friend. 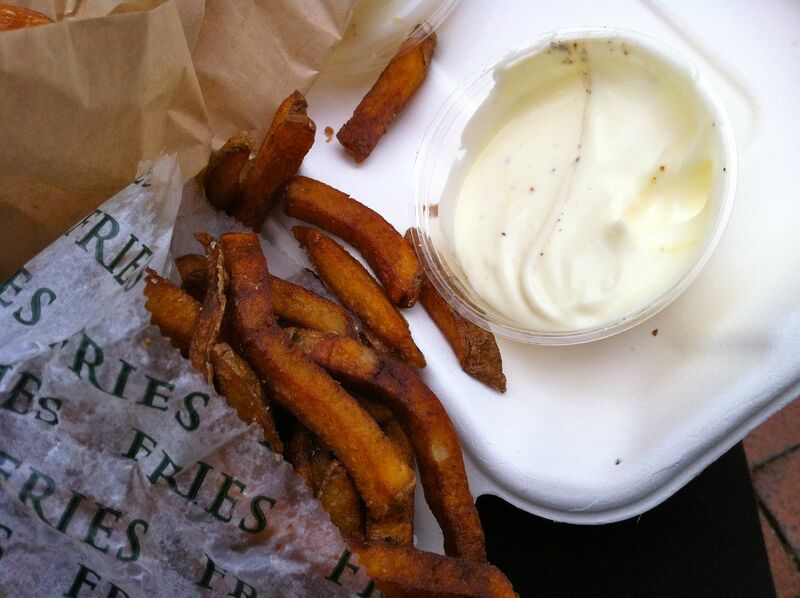 Handcut fries fried in 100% peanut oil with an optional (but let’s be clear here, there was no optional about it) garlic mayo dipping sauce…these bad boys were extra crunchy and just popped with flavor and saltiness. While the burger is the star, don’t leave without trying these guys. You were at Head House today!! We haven’t been yet this spring/summer. Today we welcomed a houseguest for a week–four-legged–who needs some TLC because she was in the hospital last week. So we stayed home. Next week, maybe, for us. And you already went to Shake Shack, too! ((Sigh)) is all I can say. Maria–this was actually a few weeks ago. Either the first or second week.